Locally specific epidemiological understanding is pivotal to the success of malaria elimination in South Africa. Here, we focus on how the host, vector, parasite and environment and their interactions have influenced malaria incidence in South Africa between 1995 and 2012. Broad environmental considerations are necessary, including the physical (temperature and humidity), social (migration patterns), economic (quality of housing stock) and political (regional collaboration). A detailed understanding of an infectious agent's epidemiology is essential for effectively targeting disease control and elimination measures. Accordingly, locally specific epidemiological understanding is pivotal to the success of malaria elimination in South Africa (SA). Malaria is endemic in northeastern areas of KwaZulu-Natal (KZN), Mpumalanga and Limpopo provinces. As a result of sustained vector control and case management, annual cases were sustained below 10 000 for many years, with approximately 8 750 notified cases in 1995. With decreased insecticide and treatment efficacy, malaria cases and deaths increased sharply from 1996, peaking in 2000. In 1996 malaria cases increased by 67% compared with the previous year, rising to over 60 000 cases in 2000 when more than 400 deaths were recorded (Fig. 1). The loss of sulphadoxine-pyrimethamine (SP) efficacy may have contributed to the huge increase in deaths during this time period. 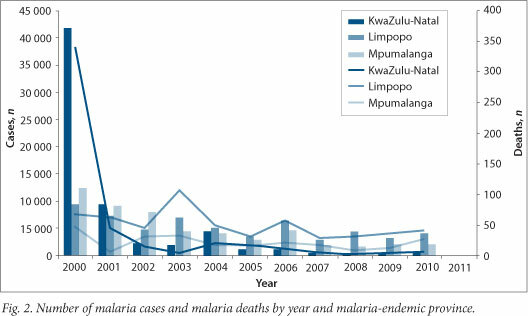 Following the introduction of an effective insecticide, artemisinin-containing combination treatment (ACT) and the adoption of regional malaria control strategies in SA, Swaziland and Mozambique, national case numbers decreased to 26 506 in 2001 and continued to decrease to <10 000 by 2011 (Fig. 1). Over the 10-year study period, the total number of reported malaria cases decreased markedly from 64 622 in 2000 to 8 066 in 2010 (Fig. 2). The largest decrease was noted in KZN, with this province reporting the lowest number of cases in 2010 (Fig. 2). Although case numbers in Limpopo declined from 9 487 in 2000 to 4 215 in 2010, this province has become the largest contributor to malaria incidence of the three endemic provinces (Fig. 2). Similar to malaria case numbers, malaria-related mortality decreased during the study period, from 459 deaths in 2000 to 87 deaths in 2010 (Fig. 2). Again, the province associated with the greatest decline in malaria- associated deaths was KZN, while the highest number of deaths in 2010 was reported in Limpopo (Fig. 2). The causative agent in over 90% of the malaria infections in SA has been and remains Plasmodium falciparum. Although extremely virulent, P. falciparum malaria infection rates were suppressed by effective control measures until the early 1980s. [2,3] SA implemented a monitoring system to regularly review the in vitro effectiveness of first-line treatment and interpret the potential contribution of drug resistance to changing trends in malaria incidence. This approach has ensured the availability of good quality data to facilitate evidence-based decision-making on drug treatment. Between 1980 and 1987, case numbers and chloroquine treatment failures in KZN Province increased sharply, principally due to the emergence of chloroquine-resistant parasites, prompting a drug policy change. SP replaced chloroquine as first-line treatment in the province in 1998, initially resulting in a decline in case numbers. Unfortunately, the development of SP-resistant parasites[5,6] led to an increase in malaria case numbers which peaked during the 1999/2000 malaria season in KZN. The deployment of ACT, using artemether-lumefantrine, in 2001 ensured a dramatic decline in malaria cases numbers, which has been sustained. Parasites in both Mpumalanga and Limpopo provinces remained susceptible to chloroquine until the mid- to late-1990s. In response to increasing numbers of chloroquine-resistant parasites, SP became the antimalarial of choice in Mpumalanga Province in 1997 and Limpopo Province in 1998. SP remained efficacious in these provinces for over 12 years before increases in both SP treatment failures and parasites carrying SP resistance markers were detected. [9-11] Artemether-lumefantrine became the drug of choice in both these provinces in 2003. Currently P falciparum parasites in SA appear to be susceptible to artemisinin derivatives and most of their partner drugs. The predominant malaria vectors in SA belong to the Anopheles gambiae and An. funestus complexes. Within the An. gambiae complex, only An. gambiae sensu stricto, An. arabiensis and An. merus have been implicated in local malaria transmission. An. gambiae s.s was eliminated from SA in the late 1960s and An. merus has previously only played a minor role in malaria transmission. An. arabiensis is thus the primary SA malaria vector. An. funestus funestus is the only member of the An. funestus complex to be implicated in local malaria transmission and it was reported to be eliminated in 1974; however, it re-emerged in KZN in 1999 and was found to be resistant to the pyrethroid insecticide used for malaria control in that province. The reintroduction of dichlorodiphenyltrichloroethane (DDT) in 2000 resulted in this vector once again being eliminated from SA. The entomology of malaria mosquitoes in SA has been well characterised.An. arabiensis is zoophilic, readily feeding on cattle or humans and is both endo- and exophagic. It has modified its behaviour to be mostly exophilic. Recently, An. merus mosquitoes have been found in increasing abundance and could become an increasingly important vector. Climate imposes distinct biological constraints on the malaria parasite and anopheline mosquito development and survival. Low temperatures slow the time to sporogony in the insect thereby reducing the probability of infectious mosquito survival. Low rainfall severely restricts potential vector breeding sites, with a major impact on vector abundance and vectorial capacity. These climatic factors have restricted the area of SA suitable for malaria transmission to the southern periphery of the continent's malaria-endemic zone. The temperate climate dictates that malaria occurrence is seasonal, restricted to the summer months when temperatures are ideal for vector survival. Climate also affects inter-annual malaria case fluctuation, although this has been enormously tempered in recent years by the effective malaria prevention and control programme. Studies of the relationship between malaria transmission intensity and climatic factors have served to explain, predict and forecast the distribution and the case numbers in different locations at different times. Malaria incidence is significantly synchronised with the El Niño Southern Oscillation, with below average incidence during El Niño years and above average incidence during El Niña years. Modelling found that inter-annual incidence variation is driven by climatic factors. Temperature and rainfall were good predictors of incidence in a 30-year analysis of KZN data, and variation in rainfall was significantly correlated with annual malaria incidence rates in Mpumalanga Province. In KZN, spatial heterogeneity in local malaria incidence was partly explained by differences in average local rainfall and temperature. The multi-factorial nature of malaria transmission has resulted in climatic models only having limited success in producing long and medium range forecasts of malaria case numbers and distribution. Malaria has serious economic impacts in Africa, slowing economic growth and development and perpetuating the cycle of poverty. Malaria epitomises a disease of poverty, affecting primarily the poor who are resident in malaria-prone rural areas with poorly-constructed dwellings that offer few barriers against mosquitoes. The global and African distributions of malaria and poverty are sympatric. Limited formal education, poor engineering and construction, and inaccessibility of healthcare, contribute to increase malaria risk in impoverished rural populations. Community beliefs can affect control, with opposition to indoor spraying, or early treatment seeking, with delays occasioned by initial care provided by traditional healers. During periods when malaria control was inadequate in SA, it posed a considerable burden on the economy of affected provinces through lost productivity, reduced tourism, and direct expenditure on healthcare provision and control programme delivery. Comprehensive systematic reviews of all malaria deaths in two SA provinces, Mpumalanga and Limpopo, demonstrated that delays in malaria diagnosis and initiating appropriate therapy were key contributors to preventable malaria deaths. Failed first-line malaria therapy and health system weaknesses, particularly in ensuring availability of appropriate antimalarial drugs were implicated in avoidable treatment delay. Malaria epidemiology in SA has been revolutionised by the availability of prompt accurate diagnosis, particularly through programme-wide implementation of rapid diagnostic tests (RDTs). Similarly assured access to therapy, demonstrated to be effective against locally circulating parasites, has been a key determinant of epidemiological trends. These factors influence the scale of the parasite reservoir, impact on absolute case numbers, confound the interpretation of epidemiological trends and have a detrimental impact on disease outcomes. There is an established precedent of confirming all malaria diagnoses in SA, rather than relying on clinical signs alone. Historically, malaria diagnosis in the malaria-endemic provinces relied upon the examination of blood smears. This resulted in delays in diagnosis and the quality of microscopy was enormously variable with poor diagnostic concordance found between diagnostic services. Delays in diagnosis contributed to higher case fatality ratios and treatment delays which resulted in increased gametocytes thereby contributing to higher transmission potential. The field testing of immunochromatographic RDTs for malaria diagnosis in Mpumalanga Province provided compelling evidence of their high sensitivity and specificity during field use by clinical and malaria field staff. [21,22] Their utility, accuracy and reliability, resulted in broad implementation as the first-line diagnostic method throughout malaria-endemic areas. This introduction of RDTs at programme level was a first in Africa; until this point, RDTs had only been used in small-scale field trials. The reliable programme availability of RDTs was confirmed during the 1998 and 2009 national malaria reviews. Having an effective antimalarial drug on the formulary is necessary, but it is equally important that health staff are well educated on its correct use, that they rapidly initiate treatment and that the health system ensures its availability at all treatment sites. Community members need to trust the drug and health system reliability or they may seek alternative and often ineffective malaria treatment elsewhere, including traditional healers, resulting in higher rates of complicated disease and poor outcomes. Stock-outs of vital antimalarials result in increased malaria transmission with higher case numbers, and most importantly, disease progression with severe malaria. A detailed study of antimalarial drug management, supply and use was conducted in KZN and Mpumalanga provinces. This study found common deficiencies in inventory control systems, with the risk of shrinkage and spoilage. Although standard treatment guidelines and regular training were implemented in the public sector, this was variable in the private sector. Exit interviews with patients indicated that there was scope for improving treatment information being provided. Patients had great trust in public sector clinics for malaria treatment; thus, drug supply systems must continually be assured. It was encouraging to note that the 2009 national malaria programme review found that stock-outs were uncommon. Active and passive case reports are fed into provincial desktop malaria information systems (MIS) and then integrated nationally using a web-based platform. Cases diagnosed in clinics or hospitals are entered in registers and reported to district offices weekly. Details of cases diagnosed by RDT or microscopy by programme field staff are entered into the provincial MIS. This allows the automated or customised generation of aggregate daily, weekly, monthly, annual or seasonal reports at facility, locality, municipality (sub-district), district or provincial level. These data facilitate detailed planning and review at provincial level, and monitoring at national level. Ongoing system maintenance, data flow and quality control are affected at provincial level with national support. Indoor residual spraying (IRS) activity is recorded on field data cards, summarised by field managers and then entered into the electronic data-management system. Captured data include number of structures sprayed, type and quantity of insecticide used, and locality of spraying. The electronic system generates routine spraying coverage rates, insecticide use, spray personnel activity and application rates. These reports assist the planning of resource deployment and timing, and support management through monitoring progress. Spatial decision support allows malaria case mapping at district, sub-district, locality and facility levels to enable interpretation of spatial disease patterns. Mpumalanga Province also maps the source of infection. The mainstay of vector control is IRS application to the inner walls of houses once or twice a year. Frequency depends on the insecticide used, with different chemicals used for traditional mud and thatch buildings and Western type structures. Over the past seventy years, IRS has been a critical factor in decreasing disease burden to levels that make elimination possible. An important challenge for successful vector control is the development of insecticide resistance in vectors. It appears that local resistance is restricted to pyrethroids in An. funestus. Isolated populations of An. arabiensis previously found to be resistant to DDT were eliminated using carbamates. An. arabiensis in SA is currently susceptible to all classes of insecticides. As current field research in this area is limited, there is a risk of surreptitious evolution of resistance without detection. SA shares borders with countries that have high malaria transmission burdens and poor malaria control. The potential exists for importation of insecticide resistant mosquitoes and/or drug resistant parasites that can cause focal outbreaks. The Lubombo Spatial Development Initiative (LSDI) was an effective initiative between Mozambique, SA and Swaziland established to tackle high malaria incidence in northern KZN Province, eastern Swaziland and southern Mozambique. The malaria control interventions already existing in SA and Swaziland were strengthened, while simultaneously introducing integrated control in southern Mozambique. After five years the LSDI strategy had resulted in a decrease in malaria incidence of 99% in KZN, 98% in Swaziland and 92% in Maputo Province, Mozambique, compared with baseline levels in 2000. Collaborative international efforts could also potentially extend the effective life of insecticides and drugs, by co-ordinating policy efforts. The high-volume migrancy across SA's northern and eastern land borders places a continuing risk to non-immune border populations. Previous efforts to screen and treat malaria at ports of entry were thwarted by malaria smear turn-around times and informal border crossings and raises sensitivities around treatment strategies towards migrant populations. 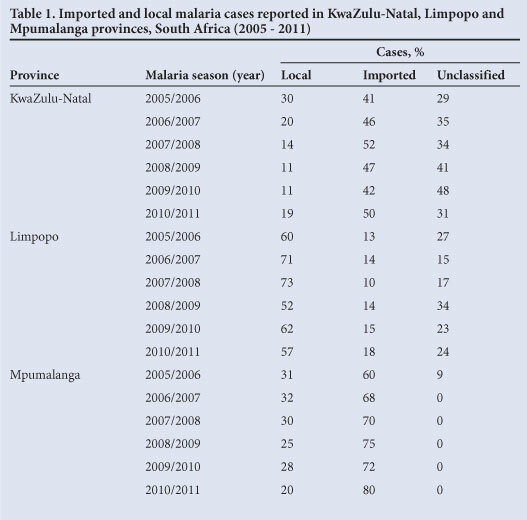 Between January and December 2011, 64% (n=6 324) of all malaria cases reported were imported (Table 1), with 85% of cases in Gauteng, KZN and Mpumalanga originating in Mozambique. Thirty percent of imported cases in Limpopo, where the source was known, were from Mozambique, and 53% were from Zimbabwe. In areas receptive to malaria, where malaria vectors are present, imported malaria can contribute to local transmission. Malaria epidemics are 'an acute exacerbation of disease out of proportion to the normal to which the community is subject'. Epidemics are common only in zones of unstable malaria, where very slight modification in any of the transmission factors may completely upset equilibrium, and where the restraining influence of immunity may be negligible or absent, and they therefore show a very marked geographic distribution. Malaria-prone areas of SA meet all these criteria, and have experienced epidemics. The 'restraining influence of immunity' is largely absent in the local population, and climatic factors are sufficiently variable to cause substantial interannual variation in malaria incidence. Comprehensive malaria prevention through IRS and effective treatment with ACT has exerted another powerful 'restraining influence' on malaria epidemics in SA. Malaria epidemics thus reflect the interplay between partial or complete failure of malaria control measures and extreme weather conditions. The KZN epidemic of 1999/2000 provides an example of the effect of twin failures of IRS vector control due to pyrethroid resistance in An. funestus, and first-line antimalarial drug resistance. Once DDT was re-introduced for IRS and artemether-lumefantrine as first-line therapy, the epidemic was quickly controlled with malaria-related outpatient cases and hospital admissions falling by 99% in subsequent years. All 3 malaria-endemic provinces are at different phases within the malaria elimination continuum (Fig. 3). In KZN, all districts have a malaria case incidence of <1/1 000 population at risk; therefore, this province as a whole meets the World Health Organization (WHO) criteria to move from control to elimination phases. Although the malaria transmission areas in Mpumalanga have decreased greatly, two municipalities within the Ehlanzeni District (Fig. 3) have malaria incidences that exceed the elimination phase threshold. One area remains in the control phase while the second falls into the pre-elimination category (Fig. 3). The incidence of malaria in Limpopo has not changed much over the study period (Fig. 3). The high-risk area in Vhembe District has changed minimally since the 1999/2000 season and remains in the control phase. 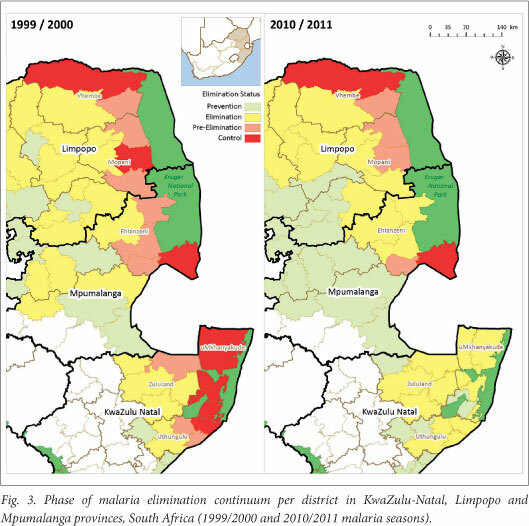 According to the 1999/2000 malaria incidence map, 2/5 municipalities in Mopani District were in the pre-elimination phase, one was in the control phase while the remaining two areas were already in the elimination phase. In the 2010/2011 map, the two areas in the elimination phase remain unchanged, while the area in the control phase has been elevated to pre-elimination status with one of the 1999/2000 pre-elimination areas gaining an elimination rating. As a result of these variances in the status of the malaria-affected districts, uniform measures cannot be implemented across the malaria-affected provinces. This poses an additional challenge in that some districts are further advanced than others. The elimination agenda cannot be scaled up until all districts reach the elimination phase. The MIS is currently used in the three malaria-endemic provinces in SA. Data are uploaded weekly by the information officer to a central server housed at the South African Medical Research Council in Durban. Data are further verified by the staff in the database section before a web-based data (Malaria Data Management System (MDMS)) warehouse is updated with the latest datasets. The MDMS utilises business intelligence technology to deliver the data in various reporting formats that are used by various staff and researchers in the South African malaria community. It is widely accepted that malaria control and elimination programmes should be owned and led by governments. Appropriate policies need to be in place to cover the wide range of activities required for malaria elimination. These policies also need to be supported with the appropriate financial resources. Moreover, when capacities within governments are not adequate to serve the needs of a malaria elimination programme, then space must be created to allow nongovernmental organisations, research and academia to come on board. SA has been successful in ensuring that key commodities are in place and distributed to facilities (e.g. RDTs, drugs and insecticides) and that vector control teams are in place. SA faces its biggest challenge for elimination from the importation of malaria from its neighbouring countries, and polices and processes need to be in place to ensure cross-border collaboration and sharing of resources to enable optimal malaria coverage within SA and its neighbours. The relationships between malaria elimination and health systems strengthening require further exploration in the SA context. In addition, the value and engagement with non-governmental healthcare providers, and outsourcing of malaria elimination functions, also needs to be considered. The essential role of full participation and engagement by communities is also required. For SA the key challenges for moving the malaria elimination agenda, specifically on surveillance, are: transmission districts and localities that are still in the control phase of the WHO's malaria elimination continuum; data quality and efficiency of data flows from peripheral to central levels; limited entomological surveillance to determining malaria hotspots; close proximity of the moderate-and high-transmission districts, and location in relation to neighbouring countries that have relatively higher burdens of malaria transmission; and regular monitoring for insecticide and drug resistance. In SA the mainstay of the control programmes is indoor spraying with a residual insecticide. This has been in place for the past 70 years and the only variable that has changed is the insecticide used. Alternative and complementary measures are now required to help get to zero cases. The incidence of malaria mortality and morbidity has declined remarkably over the past 12 years to such an extent that malaria elimination is now possible in KZN and some districts of Limpopo and Mpumalanga. There are a number ofvariables that drive transmission in SA that enhance the relationship between the host, vector and parasite. However, due to sustained malaria vector control and improved case management, the number of local cases has declined dramatically, an equilibrium has been reached, and the reorientation of the malaria control programme to an elimination one will assist in achieving zero locally-transmitted cases.